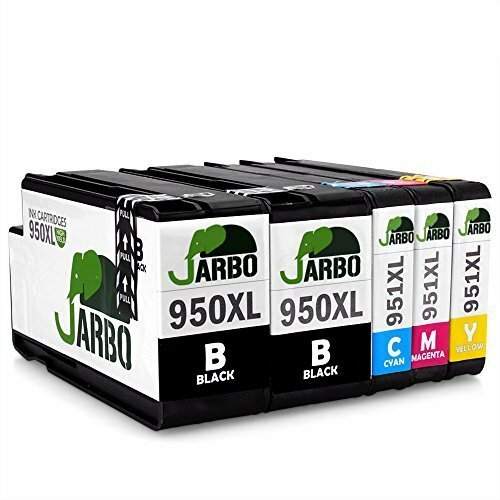 Home › Best-Sellers › Jarbo 1Set+1Black Replacement For Hp 950Xl 951Xl Ink Cartridge High Capacity ..
Jarbo 1Set+1Black Replacement For Hp 950Xl 951Xl Ink Cartridge High Capacity .. Printer compatibility:HP Officejet PRO 8100 8600 8610 8620 8630 8640 8660 8615 8625 251dw 276dw. Size: 1 Set+1BK Printer Compatibility: HP Officejet PRO 8100,HP Officejet PRO 8600,HP Officejet PRO 8610,HP OfficejetPRO 8620, HP Officejet PRO 8630,HP Officejet PRO 8640,HP Officejet PRO 8660,HP OfficejetPRO 8615, HP Officejet PRO 8625,HP Officejet PRO 251DW,HP Officejet PRO 276DW, About our product: Bright clean chip: Complex technology brings complete compatibility. Ink of great quality: The diameter of the particle is within 20 nanometers, which makes a clearprinting, great liquidity and prevents any printing head clogged. Refined structure: The ink are stored in a constant pressure structure, making stable outflow ofthe ink, which means smooth and consistent printing. Quality control: 100% post printing test for each cartridge. Note: 100% Compatible With Original printer,this is NON-OEM,. When install the new cartridges into printer,the computer would promote "Non-Original", please click "Yes" ,then the printer can go on to print. Any questions, just feel free to contact us. Principle: We offer great print quality and reliable performance for fast, professionalprinting quality. Inferior products are firmly rejected. JARBO ink, ease your mind, easy your life.